Flight Centre consultant Miles Buckeridge wittily shares with us his first experience of Australia and explains why he can't wait to go back! You know when you look at the glossy tantalising photos of the food above the kiosk in a fast food restaurant; none of us, not even the ones with the wildest of imaginations, dare to dream that what we eventually get handed over inside the cardboard box will bear any resemblance to what was pictorially promised. Well, that’s what I feared about Australia. Until last month I’d never been there. There’s no shortage of imagery for the magical land of Oz in this country; we’re fed a diet of cliché and impossibly serene paradise, hemmed by borders of eternal sunshine and a casual attitude to beer consumption. We’ve heard tall travelling tales from friends, seen photos of the Whitsunday Islands that coerce coos and accounts of close encounters with crocodiles. Should we believe what's on TV: we’d be forgiven for thinking Australia is a comfortable mix of Neighbours and nirvana; a nation exclusively inhabited by men giving inappropriate life coaching advice in huts on a beach with a Fosters beer in hand. My parents moved out to the Gold Coast (south of Brisbane) last August which gave me the ultimate excuse to arrange a visit. I booked my flight at the last minute (as a responsible - and now poor - travel agent I recommend that you NEVER do this), with a stopover in Singapore. Singapore is the perfect stopover location – it fits all the requirements for a travelling hiatus; New York meets Disney with a touch of Jurassic Park. The stifling humidity renders the experience a dream-like quality. Mine was literally a flying visit: shopping on Orchard Road, throwing a few peanut shells on the floor of the Long Bar at Raffles, night safaring at one of the worlds most impressive zoos and an evening spent with an old pal at the swanky bars in The Chimes complex. One final thing about Singapore, in Changi Airport Terminal 1 (all the terminals are connected), there is a swimming pool, it’s next to the transit hotel by the well known green coffee brand outlet – just ask if you get lost. Then on to Bris Vegas. Wow. It was great seeing the parents again but I spent the entire time running up and down the East Coast like a child on his 17th packet of Skips. The highlight for me was definately surfing in the hippy mecca and stunningly beautiful Byron Bay, a mere stones throw into New South Wales territory. 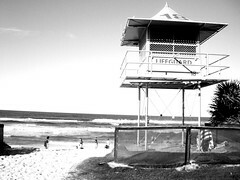 In Queensland I visited several theme parks, enjoyed an etymologically impelled surf at Surfers Paradise and a further casual one at Burleigh Heads. 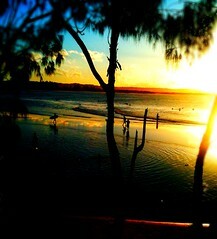 I moved North onto the sunshine Coast to Noosa; another photogenic gem on Australia’s East Coast. Here, I saw wild koala bears in trees, definitely didn’t have a barbeque on the beach because it’s not allowed (shhhhhh), and partied a fair bit. I also visited Australia Zoo, part of the legacy of the late and infinitely great Steve Irwin. I then flew down to Sydney to visit some rellies (relatives) and got the warmest of receptions in their home in the Olympic village suburbs of the city. I did a 2 day light speed tour of the city including all the usual highlights: Darling Harbour, Circular Quay, Manly Beach, The Opera House, The Rocks, The Aquarium and other things starting with ‘The’. I really could have spent more time there, and by a twist of serendipity and airport security malfunction I did. My flight was cancelled and the domestic airline Jetstar very kindly put me up for the night in a hotel in Kings Cross without the need for any tantrums. Kings Cross, by the way, can be politely described as the ‘alternative’ side of Sydney, like Soho in London. I spent a sleepless night with some of the other passengers and air stewardesses but that is another story! The remainder of the trip was spent with my family in their sanguinely named ‘Sanctuary Cove’ retreat. It’s a place where lunch takes 4 hours and people walk their dogs from the comfort of a golf buggy. Kangaroos roam the golf courses and Aussie wine is as abundant as oxygen. It’s a good place to lose time with old friends and family. If you have an ample budget (I did not), I would recommend the Hyatt there, for a lesson in splendour and Michelin starred excess. So I returned home with heavy heart and excess baggage, my flight in economy with Singapore Airlines was pleasant ( and let me tell you no amount of “but I’m a travel agent, I sell your flights every day” tantrums will get you upgraded for free). Looking back: the Aussies are a blessed but not ungrateful bunch, often true to stereotype and strangers to shyness, they live in a beautiful place that reflects their own commonly positive and laid-back lifestyles. I didn’t get to see the half of it, but I’m hooked and can't wait to go back. A wise man once said, that the whole is more than the sum of the parts, and that is never more true than with Australia, it’s a place that’s more than just the people or the vistas, the food or the weather, the culture and the nightlife. It’s a place you get nostalgic about before you even leave. On this trip I didn’t make it to Melbourne, which according to a large population of Australians (admittedly Melbournites that I met), and friends that have spent months there, is a heresy. So it’s booked in for the next visit. Australian nouns fall into 4 categories; they either borrow the old English equivalent, use the indigenous name, abbreviate the old English adding the suffix –o or –a, or just say what you see. If an Australian discovered penguins they would either be called Peng-os, wanga wongas or fish-birds. And for the arachnophobes out there I have been reliably informed that there has been no recorded fatality from a spider bite since 1979… But that’s because they hide the bodies. If Miles has inspired you to visit Australia yourself get his honest and expert advice via email.